“The purpose of it wasn’t to launch a chocolate with Vegemite that would go into our repertoire, the whole point of the campaign and activity was to generate talk about rediscovering your favourite chocolate flavours. “We have 18 flavours in our blocks range and we wanted to create a conversation about flavours and rediscovering some of your favourites whether it’s top deck or crunchy or snack. Internally, there were doubts about how the chocolate might perform or whether it would backfire on the talkability front. Such concenrs were premature. In just three weeks, shops sold out of 1.2 million blocks of the limited edition Cadbury Vegemite and “you had to pay lots of dollars on eBay to buy it after”. 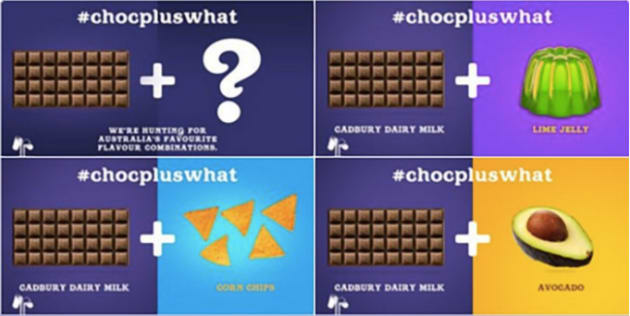 Cadbury’s #chocolatepluswhat campaign delivered strong marketing results. According to Cadbury’s media agency Carat, which was responsible for distributing the campaign and monitoring its effectiveness, Cadbury Vegemite achieved 890,600 impressions and an engagement rate of 11% – well over the benchmark of 3.35% for the quarter in the food category. The stunt was also picked up across newspapers, The Project and Nine News, as well as Buzzfeed in the US and the Daily Mail UK. 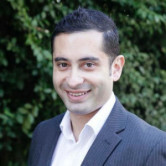 Clemmenger BBDO Melbourne executive planning director Paul Rees-Jones, who also sat on a panel about marketing successes and failures, said Australians warmed to it because when “competent brands are prepared to do something either silly or different or be wrong, we like them more”. Whether you were one of the few people who loved Cadbury Vegemite, such as this reporter, or hated it, there’s a very good chance you remember it, and the brand. Cadbury Vegemite wasn't everybody's cup of tea, but few confectionary launches have generated as much noise. It was one of the most contentious chocolate launches this country has ever seen. 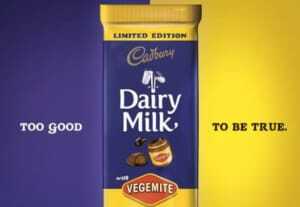 Two years ago, Cadbury decided to mix together two things Australians love – milk chocolate and Vegemite – for a limited time. For those lucky enough to get their hands on bar, the concept was either a stroke of genius or blasphemy – there was no middle ground. Last week, Mondelez International ANZ director of marketing for chocolate Kjetil Undhjem told the AdNews Media + Marketing Summit the limited edition certainly hit the spot on a marketing front. “Everybody assumed it would be a failure but actually nobody understood the purpose of it,” Undhjem said, although AdNews readers might recall the launch was always a marketing thing.